Oh. And that song is about the death of a golden retriever. Today is my sister Amanda's last day here at the paper. We've worked together for nearly three years here, through family feuds and work deadlines. And somehow, we've managed to survive. She was here with me when we got word of the death of our aunt and, later, our grandfather. She was a shoulder to cry on for me, because she really doesn't cry much herself, but me - oh, let the floodgates open! It isn't like we won't be seeing each other. We're still sisters, even though we're not co-workers anymore. She doesn't have any immediate plans for the future, but she'll be traveling to England in a little less than two weeks. Yes, we have one of those jobs where you basically have to quit to get more than two days off in a row. So she did. 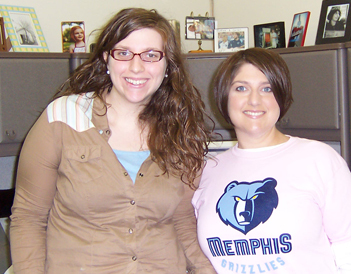 When she returns, she'll start looking for work, probably either in Memphis or closer to it. That's where her friends are, and it's where she'd prefer to spend most of her time. She'll also be moving closer there after she finds work. Luckily, she lives at home for now and doesn't have much in the way of bills, so she won't be left homeless by a long job search or anything. We had a little going away party this morning, with fruit and muffins and a cake that Amanda baked herself. It was vegan, but none of us seemed to mind. She really, REALLY wants to work at the FedEx Forum. That would be great, because she could get me some $5 game day tickets and I wouldn't have to drive up there or pay the $3.95 per order service charge. And, she'd have a better chance of meeting her Future Husband, Pau Gasol. Except, since she's my sister, that'll probably be at Anna Marie's soccer game tomorrow. I need to go get that shirt in yellow. you made me laugh with your last line in today's entry!! Yeah, I was trying to think out my next Grizz shirt color option as well. Again breaking my $10 per item rule by a good $8. Valerie - she doesn't understand why I'm getting so sad, when I'll always be her sister, even if I'm not her co-worker. It isn't like we won't be seeing each other ALL the time, at least until she moves off! Boys, you can come back now. Time for some girly talk! I am in total and complete shock. This is what they mean by "heartbreaker."